The international aerospace circus moved to Hong Kong last week in a clear demonstration that in spite of the most serious industry downturn in living memory it is strong and robust and ready to march forward towards an environmentally friendly future. Dubai is next in November followed by Bahrain in January 2010, a Farnborough year rather than Paris. For what was essentially a new project, its predecessor was located in Singapore up until 2007, the turnout was most encouraging with over 12,600 industry delegates gathered - one third of them from China. The site, called Asia World Expo, adjoins Chek Lap Kok airport, caters for everyone: a huge exhibition centre (including aircraft parking), hotels and a golf course. Disneyland is not far away. The efficient Hong Kong MTR (a project led by former Governor Chris Patten at considerable expense) will whisk you to the Island in less than 30 minutes. It is all very easy. Perhaps the highlight of the show was the increased profile of business aviation with a record 16 aircraft out in the static park, including debut appearances from Airbus Elite A318, Dassault's Falcon 7X and Piaggio of Italy's fast business turboprop, the Avanti II. Gulfstream and Cessna, both absent at Paris, were also present in Hong Kong. Bombardier made a strong showing with a Global Express, Challenger 605 and 850 (in VistaJet colours) and Learjet 60X. 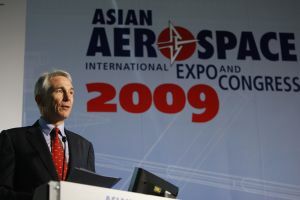 Observers remarked that the show was like a mini EBACE and predicted that this sector will return with an ever bigger presence at the next Asian Aerospace (8-10 March 2011) to avoid the typhoon season. Participants Asia Jet, together with operating partner MetroJet, announced it was introducing a new Challenger 605 into the charter market in Hong Kong; Jet Aviation confirmed a new FBO (fixed base operation) in Beijing in a joint venture with Deer Air and Reach Investment. The first luxury CRJ-200 regional jet conversion, the Phoenix CRJ, has just been delivered into Macau for operation by Jet Asia. Switzerland-based ExecuJet Aviation Group disclosed it is expanding its global activity into north Asia, building on its established collaboration with Hawker Pacific in Kuala Lumpur and sales offices in Beijing and Mumbai and long time presence in Australia. Airbus displayed the first Asian registered A318 Elite at the Show. BAA Jet Management is the type's launch customer in the region. The aircraft features a private office that converts into a bedroom with ensuite bathroom. According to Boeing, the Asia Pacific region will be the biggest growth market over the next 20 years with some 40% of the world's traffic beginning, ending or taking place there. The region (covering Australia, China, India, Japan, and Korea) currently accounts for 8,300 flights and 1.2 million travellers daily - but that will grow at an average annual rate of 6.5% over the next two decades. The Asia Pacific fleet will treble from 3,910 to 11,170 - 80% of that representing new growth, according to the manufacturer. Strong domestic growth in China, India and other emerging Asian nations will contribute to the high demand for single aisle aircraft and more than half the deliveries (5,600) will be single aisle versions. Airlines in the region will take 2,590 twin aisle aircraft and regional jet deliveries will total 440, said Boeing Commercial Airplanes VP Marketing Randy Tinseth. Hoping to capture a significant share of this growth potential is Shanghai-based Commercial Aircraft Corporation of China (COMAC). The manufacturer chose the Hong Kong show to unveil a model of its C919 airliner offering from 130 to 200 seats. With its C919 COMAC and the ACAC 70-seat ARJ21-700 regional jet programme now progressing on schedule, China is aiming to become the world's fifth major commercial aircraft manufacturer. The C919 is being built with a proposed service entry in 2016. COMAC executives will have taken the opportunity to meet Western suppliers in HK as it looks to determine risk sharing partners. The powerplant supplier has not yet been determined.